In Yu Yoyo’s “Letter of Regret”—a freeform consisting of five stanzas, the longest measuring a brief seven lines—the word “love” appears six times. There is something stubborn about its emergence and re-emergence, dressed in multiplicity, as action and act and emotion and procedure. The poem, published in its entirety below, does not stop to consider how loaded such language is, how dangerously conceptual, but merely stifles that risk with a bold ignorance. In Henry Zhang’s English version of the poem, “love” is applied much less liberally, turning up only four times. There is no retracing the tangled process of translation, but one may guess that it has something to do with how “love” weighs lighter in the Chinese language, which has ceded less value to the word in its public consciousness. Or perhaps it is that Chinese words may be constructed and deconstructed much more freely than English ones (the word 爱情 holds a distinctly more impassioned nuance than the simple 爱, yet both are translated equally as “love”). Or even that the sonic value of 爱 (ai) is measurably softer than the consonant strike of “love.” Yet the poem in both forms resonates in its unabashed use of a word that evokes nothing if used without consideration. Yu Yoyo’s work seems to say that there is no substitute for “love,” so why pretend? So it is that a word such as “love”, that has been tamed and broken, that has been the subject of failed restoration time and time again, may be revived into new dawn. “Love,” so easily lifeless on the page, is surrounded by water that drinks itself full, by milk-white linens, by a fountain pen dug into the ground, and as such is coaxed into reality, taking on the form of that ineffable thing we identify immediately, on contact, as love. How to displace living matter into print? How is it then, for a reader, pulled back into the living? There is a well-known Chinese chengyu (four-character idiom), “栩栩如生,” which describes an image realistic to the point that it takes flight from the page, leaving behind its previous existence. It is difficult to achieve this same realism with poetry, and poets often make up for the lack of visual reality in sonic resonance. Floating signifiers counteract the image but may take on an imaginary life in sound. Through literary instances of repetition, emphasis, or rhythm, the poet may morph the visual of the language into the music of the language, which may then exit the page into life. Poetry embraces the colloquial to allow the entry of a human voice. In the following Yu Yoyo poem, we witness the same metamorphosis. “Hurt,” another overloaded word, lapses into a question: “Will It Hurt”? Here sound is intimate and unavoidable. The simple, seemingly weightless refrain of “will it hurt” is not transformed through the act of translation, but announces its simplicity and resonance through its common utility in both Chinese and English. The pure “will it hurt” of a child. The bitter “will it hurt” of adulthood. The strange “will it hurt” asked by someone who knows better than to ask. In Chinese, the direct translation of “会不会疼” is “Will it or will it not hurt,” and in such a reiteration we find something solemn. An escalating demand, an urgency. Within this distance between the two languages are chances for even the floating signifiers to gasp for air, to stretch their limbs, to speak in a voice we know, a voice we answer to, a chorus of voices. Yu Yoyo’s poems almost come close to being cursory— when we are within them, we are held by language that is often supposedly too typical for poetry. Yet, we are also unseated and kept apace by the lucid and the unexpected. What we thought was human becomes animal. In the two poems above, as well as the five others included in Volume 4 of Spittoon Literary Magazine, a dream is slept once, then again. A bed warps from wood, to field, to glass. A woman washes her feet. Somebody doesn’t have a bottle opener. Alongside these vivid images the undercurrent of life runs, and with it all the unquantifiable, infinite, absolute things to which we give inadequate names. We know hurt, we know love, and we know how poetry can transform the two into an infinite wildness. Yu Yoyo was born in Sichuan in 1990 and currently lives in Chengdu. She started writing poetry in 2004, and has published the collections 7 Years and I Am Bait. In 2017, she won the Henry Luce Translation Fellowship, adding to previous accomplishments such as receiving Selected Poetry’s Pioneer Poet Award and being named Star Poetry’s Poet of the Year (2012). Her work has been translated into English, Korean, Russian, French, Japanese, and Swedish. She is also the founder of the University Students’ Poetry Web. 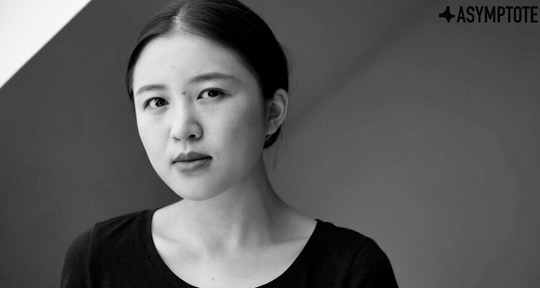 Xiao Yue Shan is a poet and essayist born in Dongying, China and residing in Tokyo, Japan. Her chapbook, How Often I Have Chosen Love, was published in early 2019. Find her at shellyshan.com.